If I had been writing this post 20 years ago, it would be very different. The essence of what constitutes Canada’s Francophone societies outside Québec has undergone an enormous transformation since 1995.
a wide e-network connecting communities and cultures across Canada and the world. The definition of a Francophone community dramatically has changed with the advent of the internet. People can reach out at the click of a mouse to interact with a larger Francophone community across their province and country. People are no longer confined by geography. I can remember when I was a child, world in which people lived in French in Northwest Alberta was limited to the local radio station, maybe one TV station, the school, community centre, and coffee shops — but that world no longer exists. The world is much much bigger now (or smaller, depending on how you look at it). Services, people, relationships, employment opportunities and a whole way of life which could never even be conceived of 20 years ago is available now. This has redefined how Francophones outside Québec interact with each other. It has given them a new sense of self-awareness, and has changed how they chose to officially represent themselves. Each territory and province has its own official Francophone Assembly or Association, but the nature of these organizations has also changed in tandem with matters mentioned above. These organizations are responsible, in large part, for encouraging Canada’s various provincial and territorial governments in their own steps to provide access to bilingual and French services, societal infrastructure, and legislation ensuring linguistic rights. Cultural activities and information (such as French movie showings, visual arts, etc.). 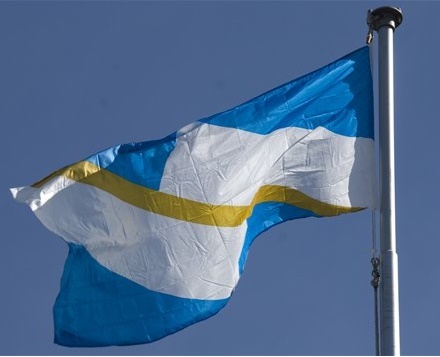 Incidentally, each province and territory has its own flag representing its unique and diverse Francophone and Francophile society. 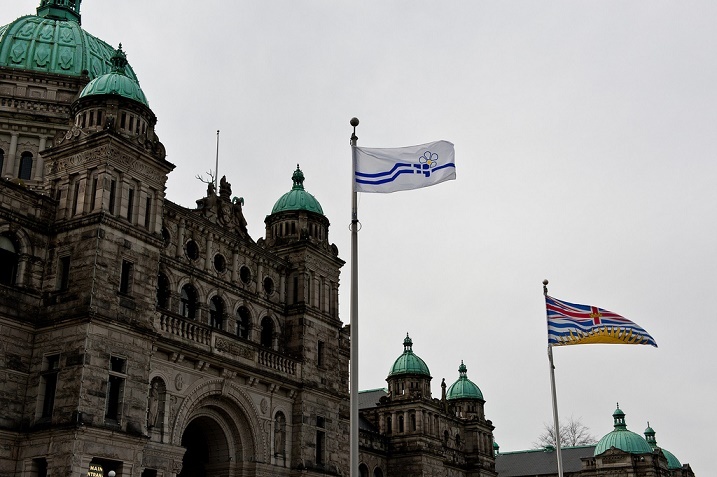 Just as Canadian society is very inclusive, so to do these flags represent inclusiveness. They have come to symbolize anyone and anything which participates in their province’s francophone society. I can offer you an anecdotal story about the flags: A number of years ago, I once had an Anglophone colleague who occasionally had interactions with Franco-Albertains as part of his work. His own level of French was not very good, but yet he very proudly displayed a small version of the Franco-Albertain flag on his desk. He explained to me that he felt it came to symbolize a part of the world in which he lived and he displayed it with proud ownership. 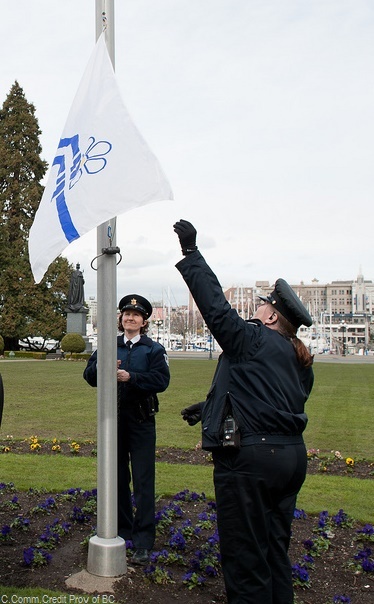 I thought that was a very appropriate way to look at the flag. They represent a sense of feeling, regardless of your origins, regardless of our first language, regardless if our families have been in Canada for 15 generations or 1 generation. They belong to everyone in Canada. You may have even seen them flying around your respective province or territory (often you’ll see them flying along side Canada’s flag and official provincial flags – in front of schools, city halls, or even as stickers on bumpers… I certainly see a a good number of Franco-Ontarien flags around Toronto, and the Franco-Albertain flag was something I regularly saw when growing up in Alberta). Along this same theme, I can offer you another story… I had a discussion a while back with someone from a small town in Québec who had not previously had much interaction with people from other provinces. He was curious about where I was from, and asked me a number of questions. The Francophone flags somehow came up in the conversation. He told me he felt they should only be representative of the original Francophone settlers (ie: Francophones de souche… a term to refer to the descendants of the colonialists of New France). He told me he didn’t think the flags should have any wider meaning, and shouldn’t be representative of anyone who doesn’t have French as their mother tongue or home language. I asked him if Québec’s flag can represent Boucar Diouf as much as it represents Francophones de souche? (Boucar Diouf is a well known television show host and columnist who immigrated to Québec from Senegal in the early 1990s). He said of course! I asked why… he responded “Because Diouf is Francophone and Québécois“. I then said, “Yes, Boucar Diouf’s “is” Francophone and Québécois, and in addition to this, his mother tongue (and home language spoken with his family) is a Senegal language“. I said however, we both agree he is still Francophone and Québecois, despite his mother tongue not being French. 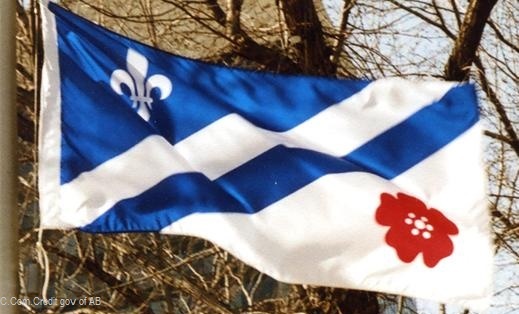 I continued by saying that Boucar Diouf is considered Francophone and Québecois because he incorporates French and Francophone culture into his daily life as one of his major lingua-francas, and thus Québec’s flag represents him as much as anyone else in Québec. I then asked him what the difference is between what Québec’s flag is to Boucar Diouf who incorporates French into his life as one of his lingua-francas and cultures, and what, for example, Acadia’s flag is to a person in New Brunswick who perhaps has English as their mother tongue, but who incorporates French into their life as part of one of their cultures and one of their lingua-francas, or as part of their life to any extent. He paused, thought for a little bit, nodded, then didn’t really have much else to say. I have a feeling his views on this, and a few other things as well, may have changed somewhat after our conversation. [As an aside, this latter example is exactly what I meant when I talked about the debate surrounding “the home language” in Montréal. In the “About” section of this blog, I stated: “In Québec, some [people] are uncomfortable about a “decrease” of French as a “home language” in Montréal. But the truth is that bilingualism is definitely on the up-tick in “absolute” numbers, both in Québec, and across Canada. That’s a good thing! The debate about one’s “home language” should have no bearing… If one is able to comfortably live, work and function in the two lingua-francas of this country, then the battle is being won. Yes, it is true that annual Immigration levels to Canada challenge the “proportional” increase in levels of bilingualism, but that is not because of a failure of multi-culturalism (as some would argue) — it’s simply a matter that many first-generation immigrants don’t have their region’s “lingua franca” as first language in the home…. BUT, their children on the other hand (second-generation immigrants) will continue to contribute to the upward-climb in the rate of bilingualism (both in absolute and proportional numbers)…. especially in light of Bill 101. This is a good example of how I hope these posts can not only bring you individual bits-and-pieces of cultural awareness, but as a whole can help to tie together a lot of small, loose ends to present a larger societal picture]. 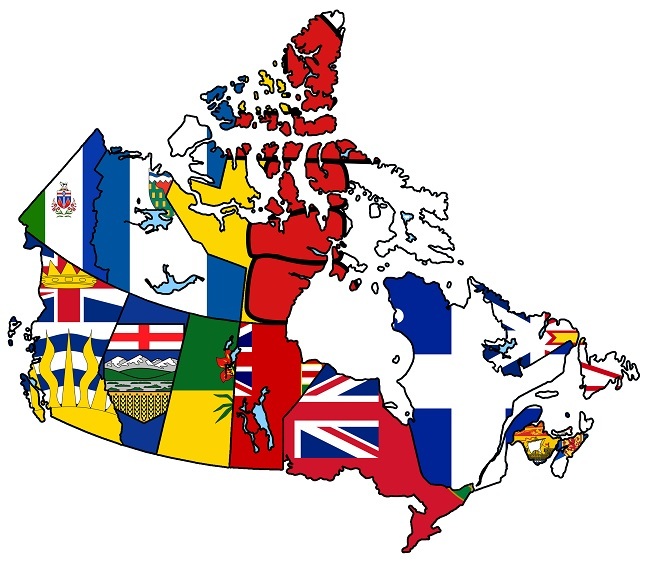 Wherever you are in Canada, as you take your own journey across Canada’s linguistic lines, you may occasionally see the presence of one of the official organizations listed below. If you want or need additional information, they are excellent sources you can turn to. As I stated, the face of la Francophonie pan-canadienne has done a complete 180 over the past 20 years, and the resources they have can help you to integrate a bit more of Canada’s Francophone heritage into your own daily life (if you want to take in a movie in French, for example, you might want to give them a call so see where you can find the closest showing. They can also help you find places to buy books in French, or find French classes). 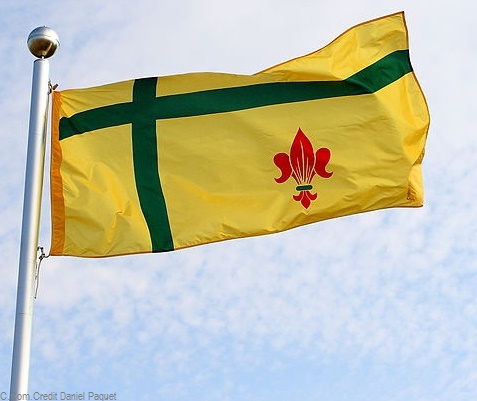 Le Fédération des communautés francophones et acadiennes (du Canada) (FCFA). 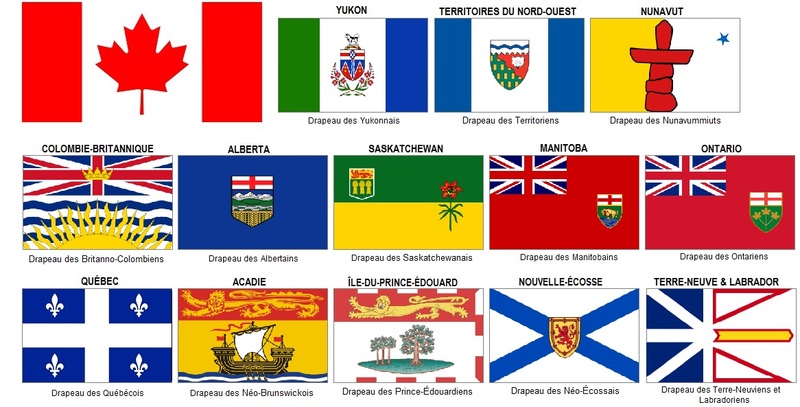 As a point of reference, the official “civil” flags of each province are provided below (which, with the exception of the flags of Canada and of Québec, are different than the provincial Francophone flags). By Quebec Culture Blog 101 in Uncategorized on December 3, 2014 .